The 1994 Boys Track Team is truly one of the finest teams to ever come out of Bartlett High School. Their 1994 season was nothing short of remarkable! In a sport where there is no defense, it is a credit to all thirty-six individuals on that team for their accomplishments! The team was coached by 2008 BHS Hall of Fame member Paul Lango. Their first big meet of the 1994 season was the District Relays. At this meet, a team which has great depth in each event is usually the winner. 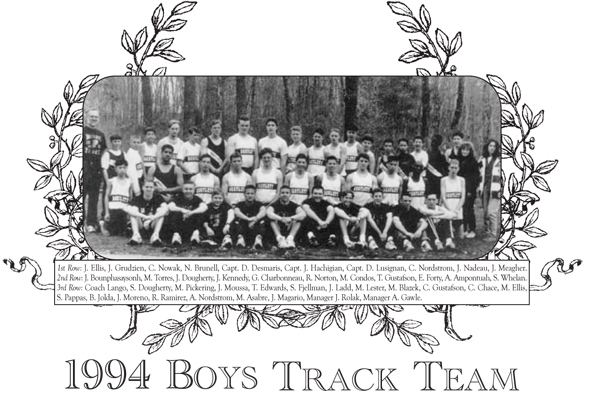 Due to the fact that the 1994 Bartlett Track Team was so strong, often having three or four quality athletes in each event, this Bartlett team placed second out of fifteen teams � scoring in twelve of the fourteen events. Two weeks later, this quality group of athletes showed their dominance by winning the District C Class Meet for the second year in a row, outdistancing themselves from the field by an incredible 23.5 points! Leading the way was Jim Hachigian who won the discus and Justin Kennedy who won the pole vault. Also scoring were Jim Nadeau, Jesse Meagher, Nate Brunell, Jerome Ellis, Chris Chase, Alex Ampontuah, Matt Condos, Mike Ellis, John Dougherty, Sean Whelan, Chris Nordstrom, Gerry Grudzien, and Dave Lusignan. The 1994 team also won the Border Conference League Meet, scoring more points than the other three schools combined! Sensational!! During the regular season, the team outscored their opponents 1182�to�518, placing first in 110 of 162 events, second in 95 of 162 events, and third in 74 of 162 events on their way to a 12�0 record. They were also 36�and�0 over the last three seasons � Incredible! Opponents knew when they were facing this team, they were in for a tough afternoon! Out of the thirty-six members of the team, twenty-six scored in dual meets. There were times when the �regulars� were given different events to participate in because of Coach Lango�s fear the score would be too lopsided. The 1994 team also placed eight members onto the sixteen-member Border Conference All- Star Team. It was through their extremely solid efforts and outstanding teamwork that this team was one of the most dominant teams in Central Massachusetts and the entire state. The 1994 Boys Track Team is truly deserving of their Hall of Fame recognition.